Pashmina Cashmere baby blankets are surely the softest, most luxurious fabric you can wrap around your precious baby! Now ChicStuff is pleased to introduce a new line of cashmere baby blankets that are even more luxurious. woven from a beautifully light 1-ply yarn. 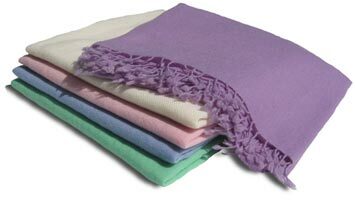 Our new cashmere baby blankets are stocked in a larger size of 36" x 45"
with a short, 1" twisted fringe. Available in a range of beautiful 'baby' colours. Our cashmere baby blankets are the perfect gift for a new baby. They can be used in the crib, for walks in the stroller, or as a receiving blanket. 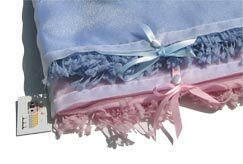 Each blanket comes in a lovely organza presentation pouch.